In the outside presentation studio complex in Red Square, Timeline TV OBs Head of Vision Quinn Cowper talked SVG Europe through its key role in delivering the BBC’s pioneering UHD HDR World Cup coverage. 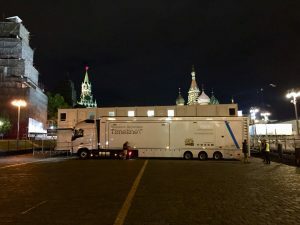 Timeline’s UHD HDR outside broadcast truck, UHD2, is on site for the duration of the tournament and at the heart of the operation based out of Moscow’s Red Square. It is delivering the BBC presentation studio with a simultaneous UHD Hybrid Log Gamma (HLG) output for the BBC iPlayer platform. Viewers with an HDR TV are able to watch the World Cup matches in UHD HDR, as well as in HD. Before the tournament, Timeline partnered with BBC R&D running various trials at York City Rugby Club and The Royal Wedding using the Sony PXW-Z450 camcorders as UHD HDR radio cameras. Due to the success of these trials Timeline and BBC are now able to provide the FIFA World Cup coverage in UHD HDR. Six cameras make up the basis of the studio. This is combined with the world feed from each stadium and brought together at Timeline’s operation in Red Square. This allows the BBC to base its operation onsite and provide a spectacular backdrop to the on-air programmes. “We’ve been talking to the BBC for about eight months about how we were going to do this,” said Cowper. 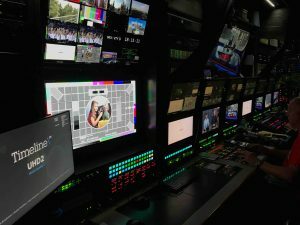 “Once the BBC agreed to take the UHD HDR feed from HBS, we wanted another way of converting the studio from HD to 4K without too much of a jump between formats. Going from 50i to 4K 50p is a long jump. “Was there something we could do in the middle? We all know and love 50i — and 99% of the population is going to watch in 50i — but we wanted to provide a better quality picture for the UHD viewers. So doing the studio in 50p meant we only had to go up one jump: we’ve already got the double frame rate and all we had to do was make the picture 4K which is easy because we could do that on the Grass Valley Kahuna,” he said. “And then going down to 50i it can also happen in the Kahuna, which means we’re not losing any quality; we already have an original 50 frame per second studio. It was all about that jump up to 4K. “We had lots of discussions with Alston Elliot about them being able to provide their AR machines in 50p,” said Cowper. “We could obviously do the cameras in 50p anyway, because that’s standard with all of our 4K services. The Kahuna can convert any format; that has been a solid way of conversion for a number of years with its Format Fusion. “For the BBC’s UHD coverage they were very clear they did not want it to affect their normal HD coverage; this was very much a trial. The UHD2 truck has been built with UHD and HDR totally in mind, so we could say ‘absolutely no problem’ when they asked the question. Running the whole show in 4K and down-converting the output to 50i was something of a risky move for them because that’s too new, too much of a difference. “We built this truck with these kinds of jobs in mind, with a dual Kahuna set-up; one Kahuna doing the normal HD coverage that we had always planned for, and a second Kahuna that has been set up here to run in what’s called Kahuna redundant frame mode,” said Cowper. “That means it follows the first mixer with every single cut and change to the keyers. Every time we cut to the IBC match feed on the HD mixer, the UHD is cut up on the UHD mixer. And all of the cameras going into the UHD mixer are 50p as standard. (They are 50p going into the HD mixer as well, but there’s obviously a down-convert on that input to get it to 50i). “So with the two Kahunas now running in parallel side by side, we haven’t affected the HD coverage at all, but given the BBC an extra layer of output that is UHD. The only thing they had to consider in our discussion was whether to do the studio in 50p or 50i. We were able to provide that as a solution for them. “The BBC view on HDR is that it will always be UHD 50 frames a second and it will be HDR and HLG – which is absolutely what this is. The whole World Cup in UHD is a big trial for the BBC; certainly from our point of view it has been really successful,” he said. “The Kahuna is doing all the conversion from the normal standard dynamic range studio and our graphics to HLG. The match feed, which is the most important bit, is actually S-Log3 from the host through a Sony production, and we convert that to HLG at the IBC with the BBC LUTs. “They use the AJA FS-HDR to do that conversion — because you can install your own Look Up Tables into the FS-HDR – and they send that feed to us so we have two incoming match feeds, now as main and spare but when we had dual-headers it was Match A and Match B. 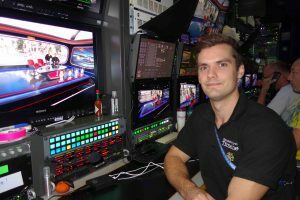 “With this method, the whole live programme transmission is delivered in UHD from the studio,” said Cowper. “The viewer has the same experience they get on BBC1 HD — it means they don’t have to switch between channels all the time to get their analysis in the full show.